The Bauchi State Ministry of Environment has urged farmers and landowners in the state to seek an expert’s advice on possible ecological consequences of indiscriminate felling of trees. The Permanent Secretary in the ministry, Mr Mohammed Umar, made the plea in an interview with newsmen in Bauchi. He said that though old trees could be felled and used because of the economic and ecological values to man, especially because of the changing weather conditions. Umar, however, cautioned that such act should be carried out after an expert’s advice. “Farmland owners should involve experts during land clearing either for farmlands or personal development so that we retain trees that can protect and benefit us as people, our animals and even plants. “Some are economic trees while others can be used either as shelter, lets or shades for even the farmers to have a rest after a day’s job. “Is not proper to cut trees but some people believe it is the size of the farmlands that will determine the quantity of the farm yield, so they indiscriminately fell trees, ” he said. 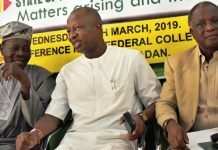 Umar said that the ministry was nonetheless, committed to partnering interested organisations and individuals to ensure that trees were replanted to replace the felled ones for conducive and healthy environment for man’s use.